Written by CMOS Bulletin SCMO on June 15, 2017 . Posted in Arctic, Oceans, What's Current. Oceanographic data delivered in real time can provide useful input to constrain and verify numerical models being used for ocean forecasting. Real time data from strategic locations can also be useful to marine operators whose activities may be impacted by local oceanographic conditions. This is particularly true where sea ice occurs. Figure 1. The configuration and location of DFO’s real time ocean observatory at Gascoyne Inlet on the north side of the eastern Northwest Passage. The dashed line across the Strait east of the observatory location indicates the location of an instrumented mooring line maintained from 1998 until 2011. Through support from the DFO Aquatic Climate Change Adaptation program, Department of National Defence, Defence Research and Development Canada and the Canadian Coast Guard, we have developed a cabled observatory technology that started providing real time ocean data from the eastern Northwest Passage in 2011. The observatory (Figure 1) uses acoustic modems to pass data from instrumented moorings (the nodes) to the end of an 8 km subsea cable (the hub). The data are then sent through the cable to a shore station where a 2-way satellite link makes the data immediately available on the web. Located on the north side of the Northwest Passage off the coast of Devon Island, the real time observatory site is close to where we maintained a line of instrumented moorings from 1998-2011 as part of a climate change study (Peterson et al., 2012). One of the outcomes from that work was the identification of links between water properties and ice cover on inter-annual time scales (Hamilton, Collins and Prinsenberg, 2013). With the real time observatory data, we have been able to exploit this knowledge of inter-connections within the local environment to use summer water temperature to predict the timing of freeze-up in the eastern Northwest Passage with several weeks lead time (Hamilton and Pittman, 2015). The long term monitoring also revealed links between water temperature and the timing and productivity of the zooplankton growth season. Thus changes in summer water temperature in this area have been shown to impact both the biology and the ice environment. Figure 2: Average early summer water temperature from 3 depths along the 200 m contour on the north side of the eastern Northwest Passage. Early summer is the period from June 21 to Aug 5. Data from 1999 to 2006 are from the Barrow Strait flow-through study and data from 2013-2016 are from the real time observatory. Water temperatures along the north side of the eastern Northwest Passage have increased dramatically over the last 2 decades. 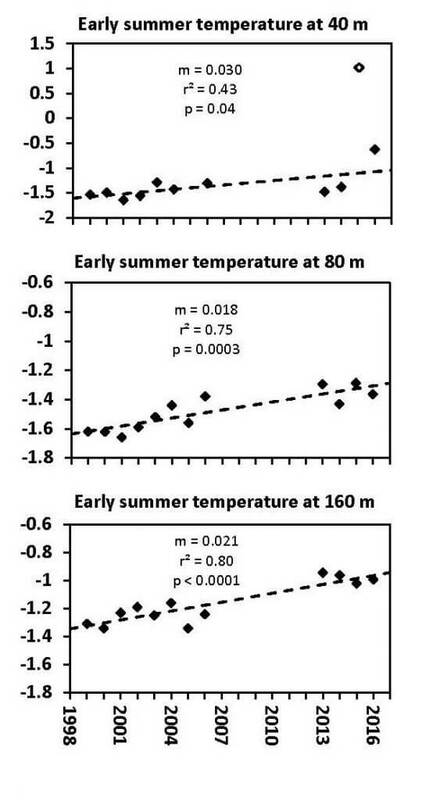 Mean early summer water temperature has risen by 0.2° per decade in the lower two thirds of the water column, and 0.3° per decade in the upper water column (Figure 2). On the north side, mean currents in early summer are near-zero, and then weakly westward (~5 cm/s) in late summer and autumn. In contrast, the mean summer flow over the southern half of the Strait is moderately strong (~25 cm/s) and eastward, and carries with it ice flushing from further west for much of the summer. This tends to keep ship traffic entering the Northwest Passage from Baffin Bay to the north side of Lancaster Sound and Barrow Strait. A continued warming trend there will impact ice conditions, leading to a longer period of accessibility for marine traffic entering the Canadian high Arctic. Understanding the impacts of this observed warming on ice conditions and on the ecosystem is a focus of our continuing research. A novel real time ice draft measurement capability was demonstrated in the winter of 2017 at our second real time observatory in the Strait of Canso, which separates Cape Breton from mainland Nova Scotia. This installation provides us with an accessible location to test new observatory developments before we implement them at our Arctic site. The ice node uses an ASL Environmental Sciences Ltd., Ice Profiling Sonar (IPS) to measure the 2-way travel time between the instrument and the underside of the ice (see Figure 3). These data are passed to our node controller where they are combined with density, speed of sound, and instrument depth data to provide an ice draft measurement (the thickness of the ice below the waterline) every 3 seconds. The data are then processed in 6 hour blocks at the node, passed via acoustic modems to the cable hub and on to the shore station through the cable. The data are corrected with barometric pressure measured at the shore station, and displayed on our observatory web page (http://www.bio.gc.ca/science/newtech-technouvelles/observatory-observatoire-en.php). The real time data delivery allowed us to watch the evolution of the ice cover as it occurred in the winter of 2017. Ice entered the Strait of Canso from the Northumberland Strait on February 7, driven by strong northwest winds. This ice quickly built to a draft of over a meter, probably due to rafting as the ice was driven against the causeway. 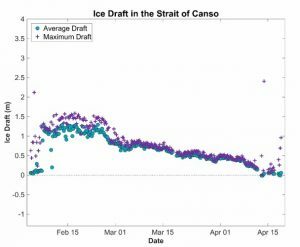 Following a brief period of open water on February 10, a draft of about 1¼ m was maintained until reducing to about ¾ m in late February and then slowly declining over the following 6 weeks until break-up on April 12 (see Figure 4). Figure 3: The ice draft node prepared for deployment. Histograms of the frequency of occurrence of different ice drafts over each 6 hour block provide more information about the mobility of the ice. When ice is not present, the IPS provides information about the wave field. Negative values are measurements of wave crests, while the positive values are measurements in the troughs. With a proven ice draft measurement capability, our intention is to redeploy our observatory in the eastern Northwest Passage in August, 2017. This effort includes the installation of a new 8 km cable to replace the cable recovered last summer which had exceeded its operational life expectancy. With a successful redeployment, we will be able to monitor the evolution of the ice cover in this remote Arctic location, watching the changes as they occur. Concurrent real time observatory measurements of water properties and ocean currents will also allow us to forecast freeze-up and potentially break-up as well. 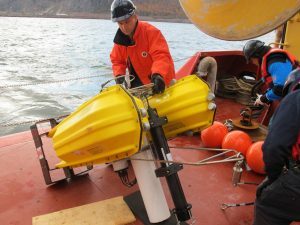 This new ocean observatory technology has design features that make it well suited for replication in other remote Arctic locations. The moored instruments collecting the data offshore are internally powered, eliminating the need to send power out the cable, thereby avoiding the need for any significant infrastructure on shore. The one critical requirement is protection of the cable from ice at the cable landfall. Figure 4: Mean and maximum ice draft measured with the real time observatory located 2.5 km north of the Canso Causeway. Each mean and maximum value is based on 7200 pings over a 6 hour period. At Gascoyne Inlet a gravel spit provides good natural protection from heavy ice pushing in from offshore but there is also a buried pipe at the beach which is critical to protecting the cable from ice at this vulnerable spot. Another feature of this observatory design is the ease with which sensors can be serviced or replaced. By using acoustic modems to pass data from the instrumented moorings to the offshore cable hub, the moorings are not physically connected to the cable. This simplifies handling by allowing for independent recovery and deployment of the node moorings and the cable hub. These deployment and recovery operations can be done from any ship, requiring no specialized equipment. As marine traffic and industrial activities increase in the Arctic, the need for timely ice-ocean information and short term forecasts grows. This information can be used to improve the efficiency and safety of marine operations and also be part of a spill mitigation strategy to minimize potential negative impacts of human activity on the Arctic ecosystem. In local areas of intensified human activity, real time data systems combined with down-scaled operational computer models provide an attractive combination to understand the environment, and to inform and respond to impacts of human activities on that environment. At the same time, these real time systems continue to provide the long term monitoring needed to identify trends, and to build our understanding of the interconnections within the Arctic ecosystem. Hamilton, J. M., K. Collins, and S. J. Prinsenberg (2013), Links between ocean properties, ice cover, and plankton dynamics on interannual time scales in the Canadian Arctic Archipelago, J. Geophys. Res. Oceans, 118, 5625–5639, doi:10.1002/jgrc.20382. Peterson I., J. Hamilton, S. Prinsenberg and R. Pettipas (2012), Wind forcing of volume transport through Lancaster Sound, J. Geophys. Res., 117, C11018, doi:10.1029/2012JC008140. Jim is an oceanographer recently retired from his position with Fisheries and Oceans Canada at the Bedford Institute of Oceanography. 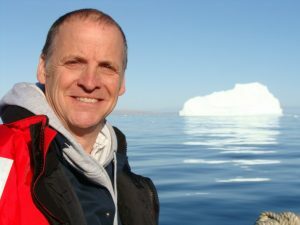 He has been working in the Canadian Arctic for 2 decades, leading a field program to quantify Arctic Ocean freshwater exports, and to identify trends in water and ice properties in the eastern Northwest Passage. This work has included the development of new instruments and techniques to deal with some of the unique challenges of working in the Arctic.